GeoTools is an open source (LGPL) Java code library which provides standards compliant methods for the manipulation of geospatial data, for example to implement Geographic Information Systems. The GeoTools library data structures are based on Open Geospatial Consortium (OGC) specifications. GeoTools is used by a number of projects including web services, command line tools and desktop applications. A stateless, low memory renderer, particularly useful in server-side environments. The parsing / encoding technology is provided with bindings for many OGC standards including GML, Filter, KML, SLD, and SE. Provide additional capabilities built using the spatial facilities of the core library. Extensions provide graph and networking support (for finding the shortest path), validation, a web map server client, bindings for XML parsing and encoding and color brewer! GeoTools also operates as part of a wider community with a staging area used to foster new talent and promote experimentation. Some highlights are swing support (used in our tutorials! ), swt, local and web process support, additional symbology, additional data formats, generation of grids and a couple of implementations of ISO Geometry. 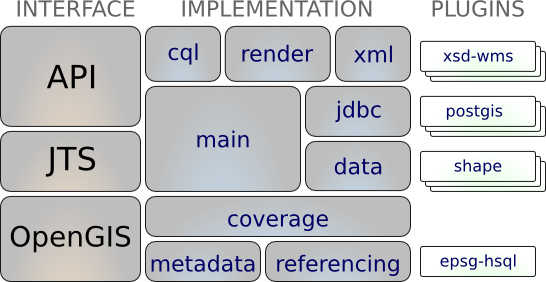 Java data structures and bindings provided for the following: xsd-core (xml simple types), fes, filter, gml2, gml3, kml, ows, sld, wcs, wfs, wms, wps. Additional Geometry, Filter and Style parser/encoders available for DOM and SAX applications.